Time to channel your inner Karlheinz Stockhausen. Koma Elektronik has developed a brand new electroacoustic workstation called the Field Kit, which is designed to process signals from microphones, contact microphones and electromagnetic pickups, and is able to run DC motors and solenoids. Not only that, but the Field Kit can also receive radio signals and convert signals from switches and sensors into control voltages. The unit comprises the Four Channel Mixer, CV Radio, Envelope Follower, LFO and DC Interface. The Four Channel Mixer is the beating heart of the Field Kit, providing a fully functional mixer with individual Gain, Mix Level and Tone control over each channel and individual Master and Aux sub-mixes. The CV Radio is a CV-controllable radio receiver capable of receiving radio frequencies on AM/FM and SW bands. Additionally, it provides the ability to catch electromagnetic waves for further processing inside the Field Kit. The frequency of the radio can be set with a dedicated multifunctional Search control which acts both as a manual CV source and as an input attenuator for a CV signal. The Low Frequency Oscillator generates periodically varying voltages to be used as control signals. The output waveform can be set with a three-position Waveform control and gives out either a Square-, Triangle- or a mix of Square and Triangle waveforms. Lastly, the DC Interface can use its output voltages to run little motors, fans, solenoids and buzzers and control them with control voltage signals. You can pick up the vibrations and electromagnetic waves with the contact microphones and electromagnetic pickup. 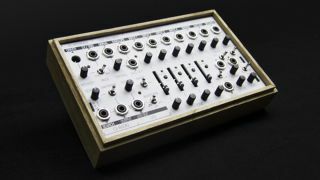 Not content with just producing the Field Kit, Koma Elektronik has also got some extras up for grabs. There are plenty of smaller products on offer, including T-shirts and mixtapes, plus you'll be able to swap the front panel for a 36HP Eurorack-friendly version, should you want to add it to your system. Aside from all that, there's also an Expansion Pack, which includes a whole bunch toys for you to plug into your Field Kit. If you want to get all up in the Musique Concrète way of life, then the German manufacturer invites you to back the Field Kit on Kickstarter with super early-bird prices starting at €199 and DIY kits set at €159. For more information, check out the Kickstarter page and Koma Elektronik website.